While the summer may be wrapping up soon, the monthly forecast still shows many more hot, humid days in store for our area. Will your air conditioner be performing at max efficiency? Does it have what it takes to keep you comfortable through this last stretch of heat? What you may not know, is that over time, dirt and debris can collect on and clog the outdoor condenser coil. Doing so can cause a number of issues, some of which include overworking the system, running up your electric bill, warm air coming out of the vents, and air conditioner breakdown altogether. THE SOLUTION: Consider washing the A/C for better operation and efficiency. Set the cooling mode to OFF on your thermostat or turn off the power source at the indoor breaker box or outdoor fuse box. Locate any collection of leaves, grass clippings, branches, weeds, etc. that are removable by hand and pull and brush them off the outdoor unit. Find a hose with adjustable pressure. Use a low-medium pressure and, starting from top to bottom, gently rinse the coil. Try spraying at different angles to remove anything that may be caught in the coil. NOTE: Do not use a power washer or high-pressure hose attachment as the high water pressure can bend/damage the delicate fins on the coil. The air conditioner doesn't need to be completely dry; go ahead and turn it back on shortly after rinsing. 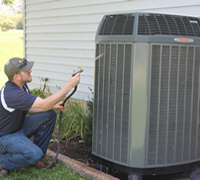 Need service or maintenace on your air conditioner? Contact our team today!